TCR Blast Abrasives is an Authorized Dealer of Clemco Industries blaster equipment and Clemco parts. Clemco provides industrial-quality blast equipment and replacement parts. We take pride in the Clemco product that meet the aggressive demands of the Abrasive Blast markets. If you are looking for portable blast machines, automated or manual blast cabinets, industrial blast facilities or dust collectors, we can help find the right model for you. We also provide Clemco Parts for existing applications. Contact us today for more information. 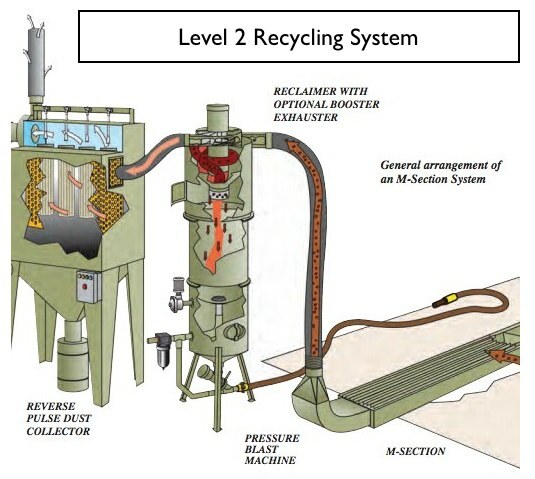 The Clemco M-Section Abrasive Recycling System is a superior Abrasive Recovery System. For an efficient, low cost abrasive recovery systems, the pneumatic based M-Section® is on the top of our list. Why is the M-Section® so good? May be configured for full-area or partial-area sweep-in recovery of spent abrasives. M-Section® systems are easy to operate and maintain - have few moving parts.